It has believed that in 1500 BC, the pharaoh Tuthmosis brought pomegranate to Egypt from Asia. The pomegranate was the symbol of fertility, because of the many seeds borne within the fruit, and the heathen regarded it as a sacred plant. 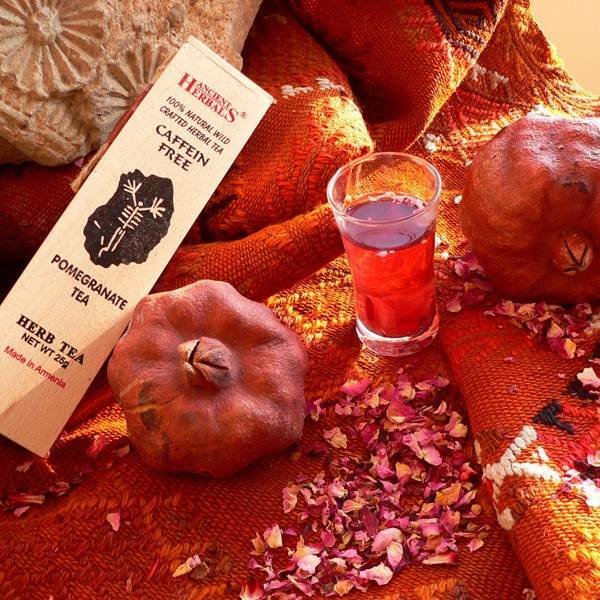 This delicious blend of new blossom flowers of Pomegranates, flavored with Rose petals and carefully selected quality Hibiscus flowers has a pleasantly sour fruity aroma: a classic closing for a Mediterranean meal. Directions: Place 2-teaspoon tea per one-cup teapot; add freshly boiling water into teapot and brew for 5 minutes. Strain in to the cup and serve hot or iced, without sugar. 25 gram loose tea in especially treated wood box pack.